November 30th in Wordpress Plugins, Wordpress Tips by Wordpress Jedi . Have you ever had to change the URL of your site completely? We recently had to move from WP JEDI to WP Solver for a number of reasons. The process is not that hard, but you can’t just move your files and database and expect everything else to fall into place. You should search your database and replace your old domain name with the new one without messing up your GUIDs and other important fields. Velvet Blues Update URLs can save you time with that. This is a time-saving plugin that lets you update your links to pages and references to images inside your database with your new domain. As you can see in the above screenshot, you can update URLs in page content, excerpts, links, and custom fields. You can also change URLs for attachments. You should not touch the GUID option unless you know what you are doing. 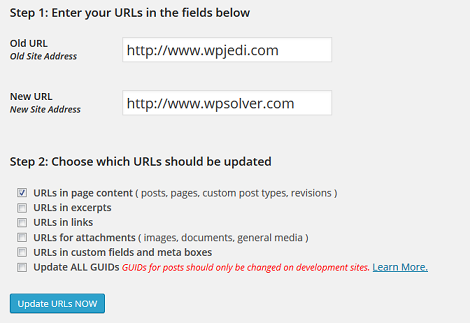 We moved WPJEDI to WP Solver using this plugin. It did the job very well and did not mess up our database, unlike a few other plugins that failed us miserably. Whatever you do, make sure to backup your site before trying plugins like this.